PRODUCT: Roof Mate HT, High Tensile Elastomeric Roof Coating, WHITE color. Meets ASTM D6083, Energy Star and is CCRC Listed. 5-Gallon Bucket. Price/Bucket. 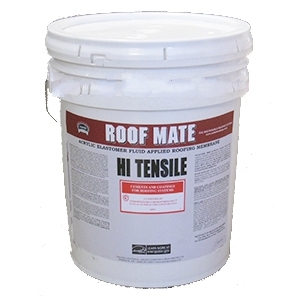 DESCRIPTION: ROOF MATE HT is specially formulated for roofing conditions subject to maintenance / light traffic applications, severe weather, chemical fallout, etc. The tensile strength and hardness are double of regular elastomeric roof coating, while still providing exceptional elongation and very low moisture permeability. ROOFMATE HT is a water-based, high solids elastomeric coating utilizing the latest advances in acrylic technology. Premium quality 100% acrylic resins are combined with reinforcing laminar pigments, an effective biocide package and non-migrating fire retardants, resulting in superior durability, weatherproofing, ultraviolet resistance, algae/mildew resistance and fire retardant. ROOF MATE HT is a highly reflective, permanently flexible “breathing” membrane, allowing moisture vapor from the substrate or building interior to escape while remaining impervious to mass water penetration from the exterior. ROOF MATE HT forms a monolithic, waterproof elastomeric seal, uniformly covering the textured profile of these substrates, providing protection from weathering, aging and ultraviolet exposure. 12. Code Approvals: ROOF MATE HT is UL classified as a Class “A” Fluid Applied Coating System, and as a Class A, B or C Maintenance & Repair System as outlined in the UL Roofing Materials & Systems Directory and UL website. It is Factory Mutual Approved for recover over FMRC rated BUR or insulated metal panels. UL 790 Class A, Factory Mutual Class I, ICC Legacy Report. Simulated Windstorm Classification Pull Tests: Wind uplift tests were conducted to evaluate the ability of the deck components to resist a simulated wind uplift force without failure of the assembly. ROOF MATE HT passed the Class 1-180 wind uplift requirements over a variety of polyurethane foams. Refer to Factory Mutual Approval Guide or Job Identification #J.I.0Z3Q4.AM. Simulated Hail Damage Tests: Simulated hail damage tests were conducted to evaluate the ability of the roof cover/insulation combinations to withstand a hailstorm without damage to the covering. After 10 drops of the impactor apparatus, the ROOF MATE HT showed no sign of cracking, splitting, internal separation, delamination or rupture. Refer to Factory Mutual Approval Guide or Job Identification # J.I.0B9A2.AM. COLOR OPTIONS: ROOFMATE HT is available standard in White Light Tan and Light Gray colors which are all certified to meet ENERGY STAR®, Cool Roof Rating Council (CRRC) and LEED reflectance and emissivity criteria. White and Light Tan also meet California Title 24 requirements. PACKAGING OPTIONS: Standard in 5G and 55G, optional in 1G pails. APPLICATION: ROOFMATE is easily rolled on, or pumped and sprayed at material temperatures of 60°F (16°C) or greater. DO not dilute. An airless sprayer is best suited for large field area applications. Use a power mixer capable of uniformly mixing the entire container prior to use. COVERAGE: MIX WELL. Apply at the rate of 1-gallon per 100 square feet PER COAT. Irregular surfaces and longer warranty systems may require more coat coating (s). ULTRASHIELD ELASTOMERIC ROOF COATING, SPECIAL COLOR, 275G/TOTE, PRICE/TOTE. (Special order item, not returnable. 2-5 day leadtime. Specify COLOR Before Adding to Cart. Discount Freight Available).